Donkey Kong Costume in a plus size! Donkey Kong really has the life, doesn't he? Over the past few decades, he's managed to make a living by tossing barrels at Mario, having parties, racing in go karts through Toad Harbor and playing his bongos in the jungle. How can you argue with a lifestyle like that? Everyone should be so lucky! Heck, if we could switch places with him, we'd probably do it in a heartbeat. But as far as we know, there's no way to get yourself physically transported into a video game (we've got some scientists working on that one, but for now it seems impossible). Of course, we're in the business of costumes, so we know the next best way to become the Nintendo character. 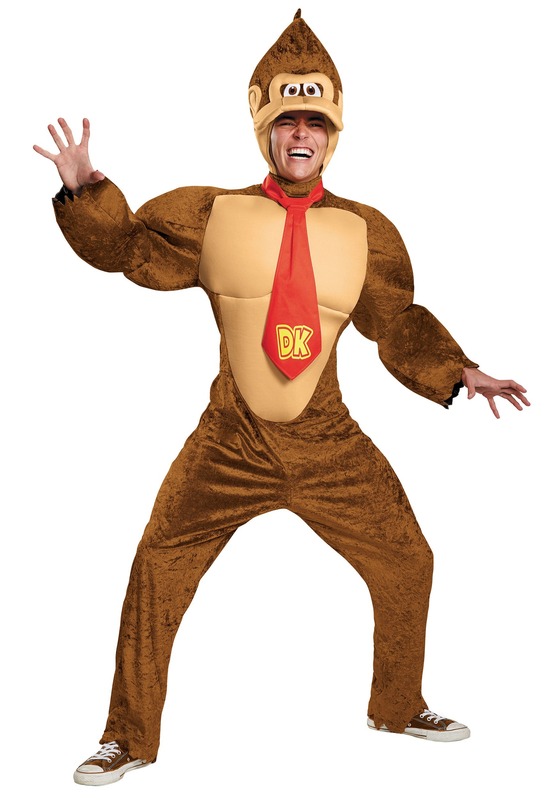 This licensed Donkey Kong Costume is a plus sized outfit based on the signature Nintendo gorilla. It comes with a full jumpsuit made that recreates his look and even has fake muscles designed right in the chest and arms. The headpiece makes your noggin look just like his, since it has his goofy eyes and mouth designed into it. And to finish it all off, you even get your own D.K. tie to wear along with the costume (since Donkey Kong is one classy and stylish ape). Once you have it on, you'll be ready to get started in the full D.K. experience. (Note: we are not liable for your actions if you decide to start throwing barrels at Mario while he frantically hops across metal girders to rescue his kidnapped girlfriend).